Jim Murphy circa 83-84 Where abouts yet to be determined. 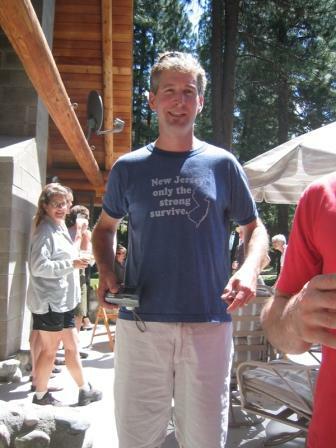 I have received a wealth of early N-Jay(NJ) pics. 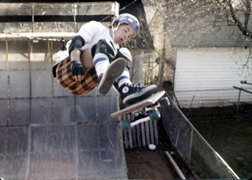 Here we have a young Jim Murphy (fakie ollie?) It is up to the collective consciousness of The House of Steam to determine where this is…how insane a pic this is needs no determining. As to our contributor I say hats off and keep them flowing, welcome on board. 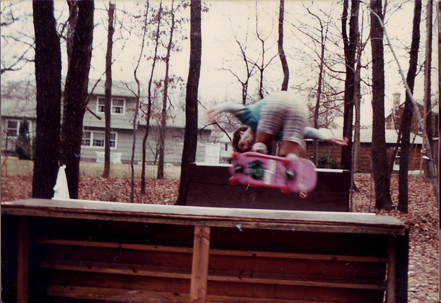 This entry was posted in 1983, Jim Murphy, TEAM STEAM and tagged ART, backyard ramps, bam, boards, east coast, house of steam, jason, Jason oliva, jasonoliva, Jim Murphy, New Jersey, New York City, nj, oliva, paintings, photography, pool Skating, ramp, ride, sk8, sk8t, skate, skate decks, skate history, skate photography, Skate ramps, skate trucks, skate wheels, skateboarding, skateboarding history, skateboarding photography, skateboards, skatepark, skater, SKATERS, steam, Street Skating, TEAM STEAM, The Barn, The House of Steam, thos, vert, vert ramps, Vert Skating on October 30, 2008 by jasonoliva. Stumbled across The House of Steam through a link on You Tube. Amazing archive of stuff here. I think you knew my brother Matt growing up in Warren. I’m sure we must have crossed paths. 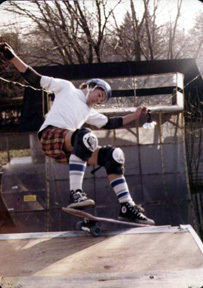 I skated with Dan, Jeff, Weeps, Rocky, Ben and the Kanes through the end of high school and unfortunately really lost touch with everyone when I went to college. Seeing all the photo’s brings back a flood of memories. 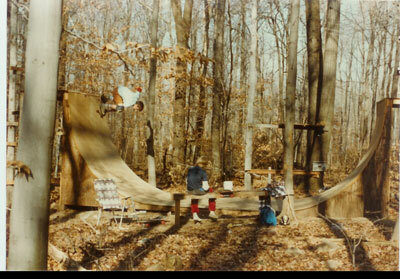 I have a ton of old photos of the first ramp Dan Tag and I built in his woods when he still lived on Red Hill Road and I lived on Olsen Drive. 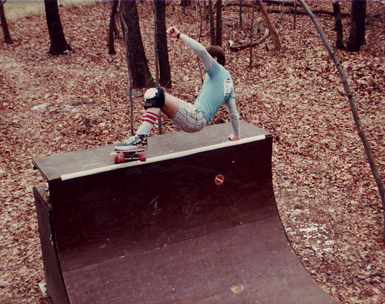 I have a bunch of our ramp as well, including a lot of shots from our driveway on the quarter-pipe. I’ll attach a few pics here from the ramp at Tag’s place. 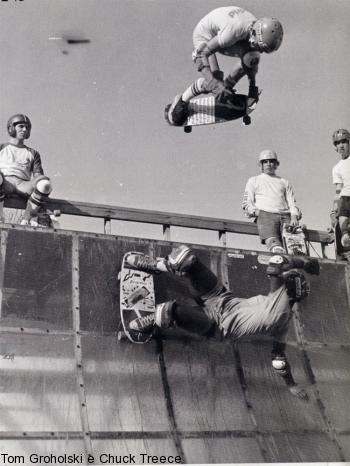 Thats me doing a backside grind while Dan looks on, the other is the full ramp with Dan landing a mute air, and goofy one of Rocky, Dan and my brother Matt. We must be around 12 or 13 years old. Amazing. These might be too old school compared to the incredible shots you have here, but I thought you might get a kick out of them. Awesome pictures (exactly what I am looking for!!) here and hopefully more to come. 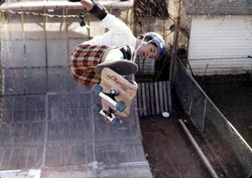 I most certainly remember you (The Padulo brothers), we skated your quarterpipe and ramp on many an occasion. Great to be back in touch. 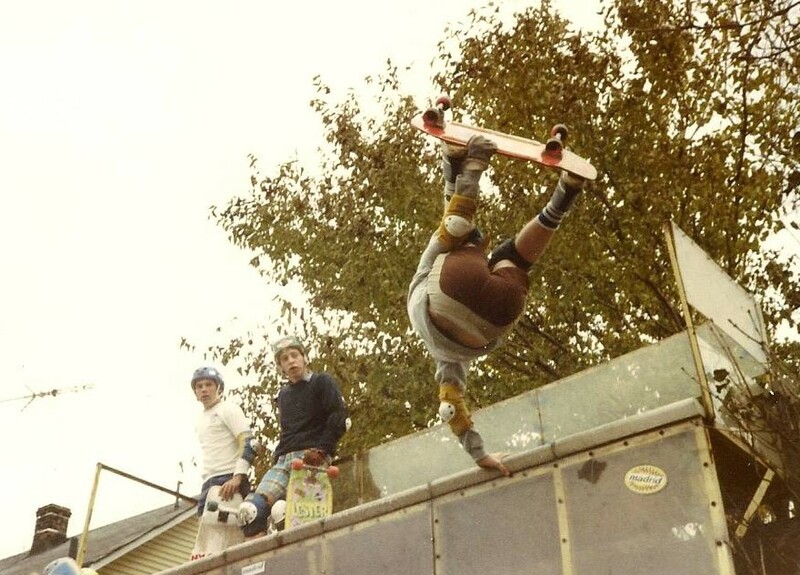 This entry was posted in 1983, Dan Tag's Ramp, Dave Padulo, Matt Padulo, Photos by The Padulos and tagged ART, backyard ramps, boards, Dan Tag, Dave Padulo, east coast, house of steam, jason, Jason oliva, jasonoliva, Matt Padulo, New Jersey, New York City, oliva, paintings, photography, pool Skating, ramp, ride, sk8, sk8t, skate, skate decks, skate history, skate photography, Skate ramps, skate trucks, skate wheels, skateboarding, skateboarding history, skateboarding photography, skateboards, skatepark, skater, SKATERS, steam, Street Skating, TEAM STEAM, The Barn, The House of Steam, thos, vert, vert ramps, Vert Skating on February 14, 2008 by jasonoliva. Groholski’s ramp. 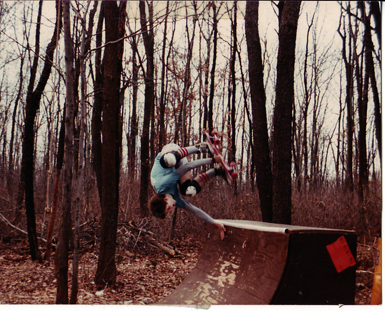 ’83-’84 New Brunswick, NJ. every run with no problem at all…. his patented nosepickin’ lein airs. Funny, that’s how I do ‘um now…. 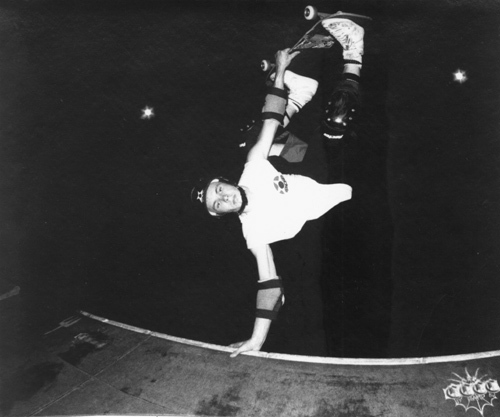 I got to skate at Tom’s once with Dan Tag and Tom. Cant say I took to the ramp all that well. I remember it being ridiculously slippery as well. After I managed to pull all the tricks I knew at least once I called it quits and watched Tag and Tom do there thing… I always had a camera but not that day for some reason…too bad. 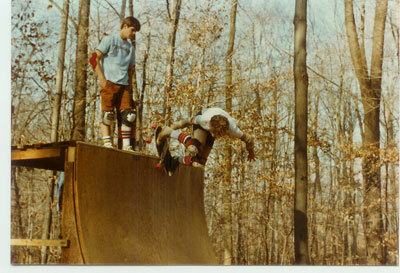 I remember Tom Talking about taking the summer to skate with Wilkes and work on 540’s must have been 87 or so. PS Checkout Mertzworld.net it rules and remains a precursor to The House of Steam in my mind. There are tons of pictures, accounts and where are they nows. All from Robs illustrious skate history….and alot of pink letters too!! 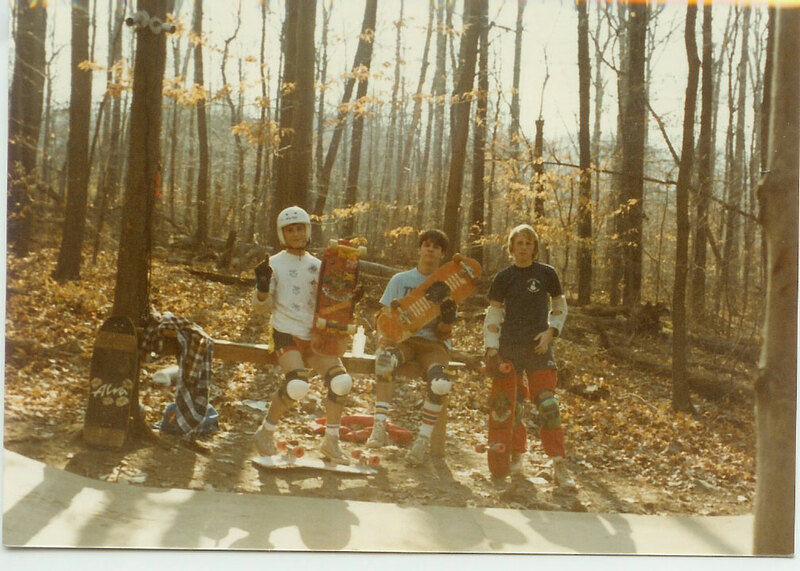 This entry was posted in 1983, 1984, 1985, Jason oliva, Rob Mertz, SPOTS:, TEAM STEAM, Tom Groholski and tagged ART, backyard ramps, boards, east coast, house of steam, jason, Jason oliva, jasonoliva, New Jersey, New York City, oliva, paintings, photography, pool Skating, ramp, ride, Rob Mertz, sk8, sk8t, skate, skate decks, skate history, skate photography, Skate ramps, skate trucks, skate wheels, skateboarding, skateboarding history, skateboarding photography, skateboards, skatepark, skater, SKATERS, steam, Street Skating, TEAM STEAM, The Barn, The House of Steam, thos, Tom Groholski, vert, vert ramps, Vert Skating on July 31, 2007 by jasonoliva. 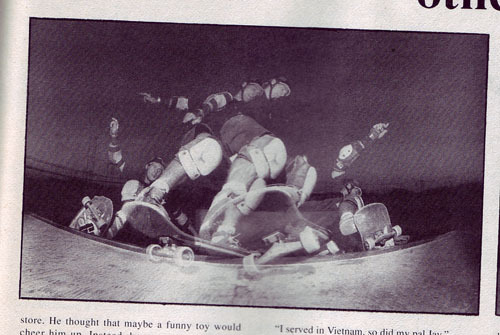 This was a letter written to Thrasher magazine in 1983 by Team Steam’s Captain Jon Ballon. The Bernie he is referring to is his best friend Bernie O’Dowd. 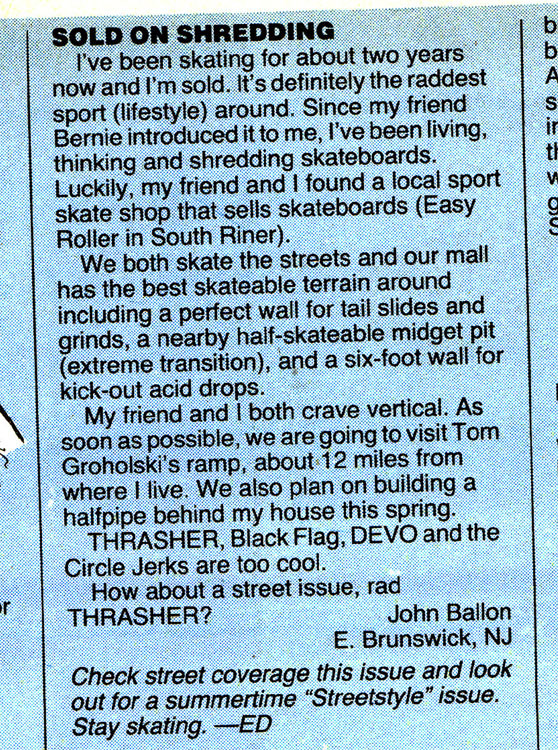 According to Bernie this letter was read by Tom Groholski’s Father who Invited John and Bernie over to skate Tom’s backyard ramp. They all became fast friends and the rest is skating history folks…. 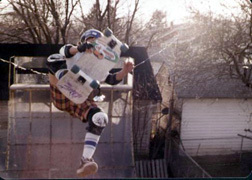 …and Captain…THRASHER, Black Flag, DEVO and the Circle Jerks are still too cool! 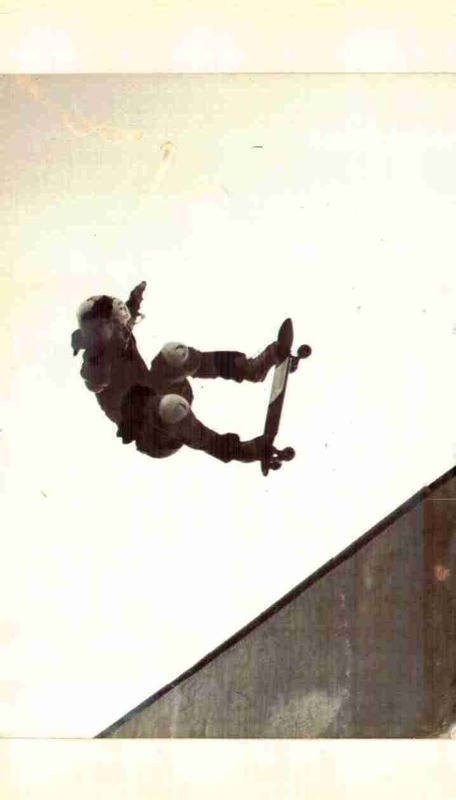 This entry was posted in 1983, Bernie O'Dowd, Groholski's Ramp, John Ballon, TEAM STEAM, Tom Groholski and tagged 1. [SKATERS A,B,C], ART, backyard ramps, barn, house of steam, jason, Jason oliva, jasonoliva, John Ballon, New Jersey, oliva, paintings, ramp, ride, sk8, skate, Skate ramps, skateboards, skatepark, skater, steam, Street Skating, TEAM STEAM, The Barn, the captain, the captain john ballon, The House of Steam, thos, Thrasher Magazine, vert, Vert Skating on September 8, 2006 by jasonoliva.